I’ve run into a little problem. Today I had to reload our inventory via the Data Import tool. Everything is working fine, but when sales where recorded, I noticed that all sales are being recorded to 1 Cost Center. We have 10 stores, each one with its own Cost Center. We sell through the POS, and each POS Profile has their own Cost Center setup. In the profitability report I show all of the sales being recorded to 1 Cost Center, even though, the warehouse and all other information is for a different Cost Center. Balance sheet is not correct as it is includes both 18 & 19. I have to close 2018 for financial report. From there create a new fiscal year (which I’m asumming you already did). At the top right under the “Menu” and “Save” buttons you’ll se a “Default” button. 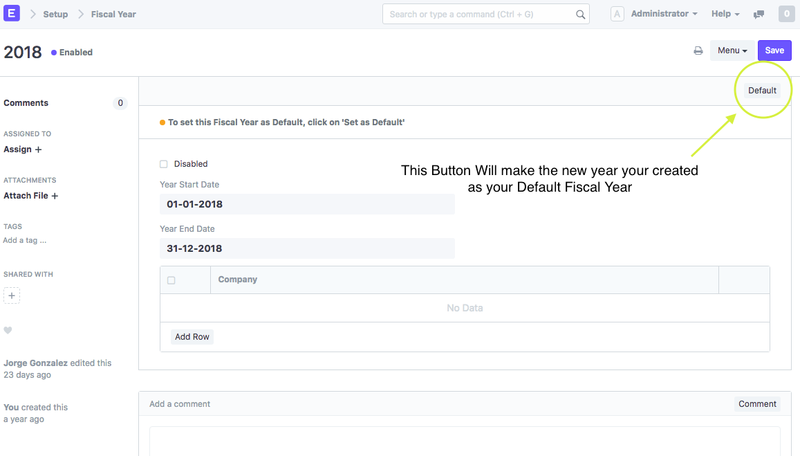 If you click that button, ERPNext will make this new year, your default and thus show all of the reports according to this new year. So I was able to figure this out. Apparently when the system was reloaded, we were not careful enough to check that everything was working well. As we were working on the POS Profiles, double checking everything, we noticed that all of the POS Profiles had their Cost Center missing from their individual setup. This caused all of the sales to go to the Default Cost Center. Once we restored the system again to the proper configuration we had our employees log out to reset the session and that fixed it for us. Hope this helps anyone that encounters a similar issue.